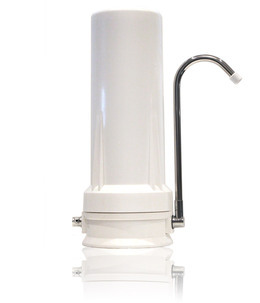 The FLO provides filtration for most common contaminants, such as chlorine, chloramine, heavy metals, tastes, sediment and volatile organic compounds. Like all Vitev systems, we use a special carbon that is 8x more effective than the average filter or ionizer. City water supplies are constantly changing and you want your filter to stay ahead of them. After the water is filtered, the FLO uses a re-mineralization process to add minerals back and create alkaline water naturally. Just as nature has layers of sediment, soil and various rocks for the water to seep through, we use layers of calcium, magnesium and infrared, energetic ceramics. Each is dissolved and reacts with the water imparting some of it's many benefits. Why use artificial means when nature figured this out a long time ago? If you've been considering a high-priced electric alkaline water ionizer, this is a smarter choice. Better filtration, smaller size, easier operation, no lights or noises and no wasted water? All the benefits of alkaline water for a fraction of the price. Ignore the FLO color, we used one of our test cases in this video. Most importantly, the FAUCET MUST BE A STANDARD VARIETY. If your faucet pulls out or has a spray function, the FLO will not work in your situation. A quick video is below. The installation and user manual is available here. Very well...here's an example of both the process and performance. Copyright © 2015 - 2019 Vitev Asia Limited. All Rights Reserved.